Ask RP Photonics for advice on which technique is best suited to measure the linewidth of a laser. RP Photonics can also help with setting up a linewidth measurement system, including the data acquisition. The self-heterodyne method  is a heterodyne technique which can be used to measure the linewidth (width of the optical spectrum) of a laser, particularly a single-frequency laser. 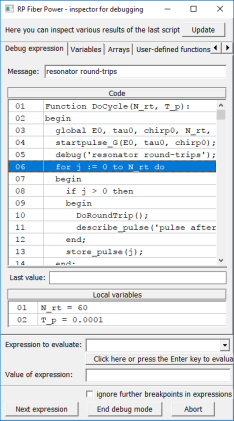 The basic setup is shown in Figure 1. One portion of the laser beam is sent through a long optical fiber which provides some time delay. Another portion is sent through an acousto-optic modulator (AOM), which is driven with a constant frequency (typically some tens of megahertz) and shifts all the optical frequency components by that frequency. Both beams are finally superimposed on a beam splitter, and the resulting beat note (centered at the AOM frequency) is recorded with a photodetector (typically a photodiode). From this signal, the laser linewidth can then be calculated. 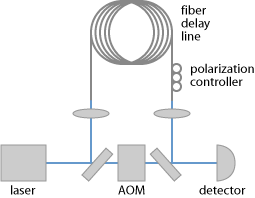 Figure 1: Setup for self-heterodyne measurement of a laser linewidth. For sufficiently long delays, the superimposed beams are essentially uncorrelated, and the output spectrum becomes a simple self-convolution of the laser output spectrum , from which the laser linewidth is easily retrieved. However, what “sufficiently long” means in a specific case, can be a difficult question. The criterion which is usually used is that the delay length must be larger than the coherence length, and the latter is derived from the (measured) linewidth itself. This is correct for white frequency noise, but not in situations with higher (e.g. 1 / f) low-frequency noise , as can occur e.g. for narrow-linewidth fiber lasers. If such issues are not completely understood, the measured linewidth values may be wrong (often too low). The delay time in the self-heterodyne setup can be interpreted as a finite measurement time, which implies that the impact of noise frequencies below that inverse measurement time is low . A consequence of that is that measurements with shorter delay time yield smaller linewidth values if the instantaneous frequency fluctuations exhibit substantial 1 / f noise, as is the case for many laser diodes. For lasers with a very narrow linewidth (long coherence length), it may not be practical to have a long enough time delay to obtain uncorrelated beams. In that case, shorter delays can be used, but the data processing then has to be substantially more sophisticated. Another possibility is to use an extension of this method, based on recirculating fiber loops .